The adorable family of meerkats at Edinburgh Zoo started the Christmas celebrations early this year when they got a visit from Santa’s sleigh on the morning of Tuesday 15 December. 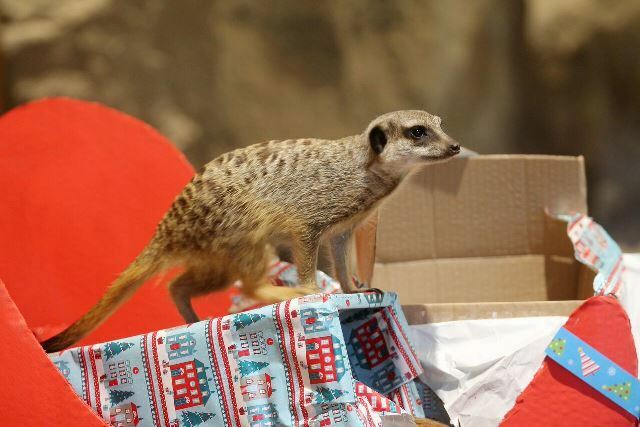 Pulled by reindeer and packed full of wrapped Christmas presents, the meerkats were in for a surprise when they discovered all their favourite treats inside their festive gifts. They clambered over the sleigh, ripped off the wrapping and nibbled the boxes, delving into a selection of fresh bugs and critters – yum! Enrichment is a vital part of animal husbandry at RZSS Edinburgh Zoo as it encourages natural behaviours like foraging and problem solving, keeps the animals active and presents them with new challenges, and they were certainly kept on their toes as they rummaged through the festive spread. We wish all the animals at Edinburgh Zoo a very Mee-ry Christmas!